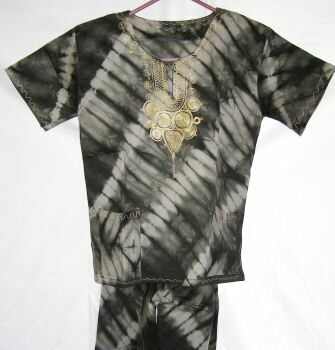 This medium weight cotton shorts set was made by Rose Mugzu in Kenya, Africa. It is a one of a kind outfit. The top measures 16″ from shoulder to shoulder and 17″ across the chest. From the shoulder to the hem it measures 22″. There is a band of 1″ of hand machined embroidery around the neck with a 9″ long design on the front. The 3″ V neck closes with a button. There is a single strand of embroidery around the sleeve ends, shirt hem and front carge pockets. The shorts have an elastic waist, and no pockets. The waist measures 16″ relaxed and 26″ totally extended. They are 16″ from the waist to the hem with an 8″ inseam.